“The sport of horse racing is the only instance where the participation of blacks stopped almost completely while the sport itself continued—a sad commentary on American life…Isaac Murphy, so highly admired during his time for his skills and character, would have been ashamed of his sport.” –Arthur Ashe, quoted in Hotaling. Today, on the day that honors the legacy of Dr. Martin Luther King, Jr., Aqueduct runs the Jimmy Winkfield, named for the black jockey who won two consecutive Kentucky Derbies (1901 and 1902). From the inception of organized racing in this country, black jockeys dominated: they won 15 of the first 28 Kentucky Derbies, a fact nearly impossible to reconcile with the virtual invisibility of African-Americans in racing today. I wrote on this topic last August, at the yearling sales in Saratoga, and Vic Zast recently commented on the dearth of black people in racing’s offices. The disappearance of black people from racing, jockeys in particular, is largely attributed to a variety of social and cultural forces: the move away from the rural South, where black people worked on farms and grew up riding horses, to the urban north, followed by the racism that plagued the United States, resulting in the exclusion of blacks from jocks’ rooms across the country. There are still plenty of black folks working on the backstretch, though there as in the saddles African-Americans have been largely replaced by Latinos. And while the crowd on the aprons at the downstate New York tracks is fairly diverse, the same cannot be said of the clubhouse or in the winner’s circle. Only turf historians, or perhaps those who heard stories told by their grandfathers, would have recognized Winkfield’s name in the United States this decade. That deplorable fact has begun to be remedied in the last decade: Winkfield was inducted into the Racing Hall of Fame in 2004, and since 2004, two books (listed below) have been published about him. Beyond his accomplishments in this country in the saddle, Winkfield was a champion jockey in Russia and won major stakes in France; he was also a successful trainer in France, where he opened a school for jockeys following his retirement. A shameful element of Winkfield’s biography is that, having returned to the United States during World War II, he worked as a groom—only can only surmise that he was unable to find other work in the racing industry due to discrimination. Following the war, Winkfield returned to Europe. I found it rather astonishing that Winkfield is not listed in the index of William H.P. Robertson’s A History of Thoroughbred Racing in America—is it possible that such a history could be complete without a mention of the man who was the first to win two consecutive Derbies, and who remains one of only four who have accomplished it? I am aghast that NYRA has carded the Jimmy Winfield Stakes as the third race. Am I over reacting? 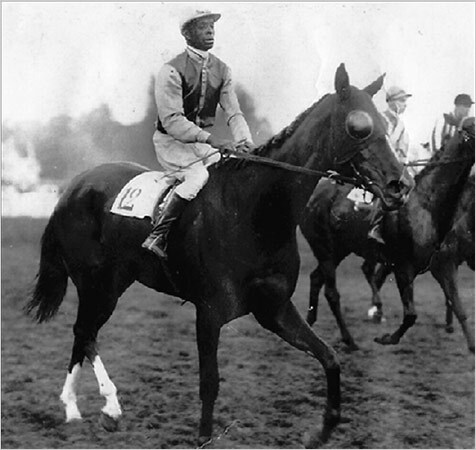 This race was renamed from the Best Turn to honor the African American Hall of Fame jockey Winkfield, whose life is legendary. It is specifically carded on MLK Day, one of the few things NYRA has gotten totally right in recent memory. It DESERVES to be treated like any other FEATURE race, run in the traditional feature spot, the 8th race. Seems a fair point. I’ll leave the conversation about betting and the Pick 6 sequence to those better informed and more interested than I; from a purely symbolic point of view, I agree with this commenter, and I wish that the Jimmy Winkfield had pride of place as the penultimate race on the card. That said, a fine gesture imperfectly executed is no less fine because of that execution. Kudos, then, to NYRA for establishing a race to keep alive Winkfield’s substantial racing legacy. A marginalized man in a now-marginalized sport, Winkfield deserves at least that much. See also my post from January 2007 on Winkfield. Wink: The Incredible Life and Epic Journey of Jimmy Winkfield, by Ed Hotaling, published in 2004 by McGraw-Hill. Black Maestro: The Epic Life of an American Legend, by Joe Drape, published in 2006 by HarperCollins. Photo credit: Nellie Davis, Black Maestro, published in the New York Times, May 29, 2006. Eskenazi, Gerald. “Jimmy Winkfield, Jockey, Dies; Rode 2 Derby Winners in a Row.” New York Times. 25 March 1974. 18 Jan 2008. Couldn’t agree with this post more – this needs more attention, especially because the move away from African Americans in the horse industry – both jockeys and grooms – is part of a larger historical narrative that includes the exodus of black Americans from rural areas. This is history that should be remembered, and Winkfield should be lauded, both for his accomplishments in America, and those in Europe. I’ve had the pleasure of getting to know Winkfield’s daughter, Nellie, who still lives in France not far from Maisons-Laffitte, where Jimmy trained. She was unfortunately estranged from her father for many years but reconnected shortly before his death. She is putting out her own book about him (in French) this year. It’s a shame that after all these years, racing is still very much a white man’s (and I mean MAN’s) sport. I learned of Jimmy Winkfield on a trip to the Kentucky Derby Museum. I am well read on the history of the sport from 1929 on, but he just escaped me, and there are few nods in his direction in print. His career and life really is the stuff of movies. Well done. Great post Teresa -I couldn’t agree more. I have to recommend “The Black Maestro.” It is an excellant account of his life. Not only did “Wink” have to overcome racism but blackballing within the sport for which he was never able to overcome. It is a shame that he still does not receive the honors he deserves (IMO).I felt honored last year when I was approached during Black History month as to whether there were any biographies from the racing industry that they could include on our company bulletin board and if I would write it since I was the office “racing expert.” I wrote about Wink and afterward a coworker who is African-American said that they had a new respect for the Derby now because they hadn’t realized its history. There are almost no African-Americans at the track in New York. They have no interest in the game. 99% of the blacks you see are in the grandstand or backstretch are Jamaican or some other Caribbean background. The Jamaican culture is very different than the American black culture and not to be confused. Thanks, everyone, for the comments and for reading, and for contributing to what we know about Winkfield. It is a great, and unfortunate, story, both about the man and the social and cultural forces in this country.Trip: Thanks for the book recommendation–must get on it!PowerCap: I deliberately didn’t refer to the crowds at Belmont and Aqueduct as African-American, for the very reason that you cite. I wouldn’t go so far, though, as to say that African-Americans have “no interest” in the game–that seems a little general to me. A few years ago, I reported in the Post that the Maryland Jockey Club was running the “J. Edgar Hoover Handicap” on Martin Luther King Day. They were asleep at the switch. They fixed it by moving the Harrison Johnson Memorial, honoring a black trainer who had died, but this year there was no stakes because there was no money to run it. Johnson’s family always came to participate in the winner’s circle ceremony. The guy who presented the trophies, by the way, also was let go . . . The right guy won yesterday. We’re getting there. – J.S.